Glenn Maxwell scored his first century for Yorkshire yesterday making 111 from just 76 balls. He struck eight fours and four sixes as Yorkshire beat Worcestershire by 133 runs (Picture: Steve Riding). GOING to watch Glenn Maxwell play cricket is a bit like going on a blind date. If that is the thrill of it, it is also the terror from a Yorkshire fan’s perspective. The supporter arrives with his heart in his mouth, not knowing which Maxwell is going to turn up. The Maxwell who turned up yesterday was the one who can play like few players can. It was the Maxwell who lit up the recent World Cup, the Maxwell that Yorkshire want to see more of, if truth be told. Yesterday, the Australian hit a superb 111 from 76 balls with eight fours and four sixes – his highest score for the club – as Yorkshire made 345-6 after choosing to bat. Worcestershire were dismissed for 212 in reply, Steve Patterson returning 5-24 as the visitors prevailed by 133 runs. “It was good to finally get the three figures for Yorkshire,” said Maxwell, whose previous best innings for the club was 92 not out against Nottinghamshire at Headingley in the T20 Blast. “I felt like I’d been playing really well over the last two months, but haven’t really put it all together. “This time, it was nice to get past that little landmark and hopefully it sort of opens the floodgates a bit. Yorkshire’s total was their joint third-highest in one-day cricket and featured a number of fine contributions. Alex Lees hit 67, the left-hander standing in as captain for Andrew Gale, who landed awkwardly on his right wrist while fielding against Worcestershire in the recent County Championship match at Scarborough, and who plans to return to action at next week’s Scarborough festival. In bright sunshine, Lees added 61 for the first wicket with Andrew Hodd, who made 18 before he was caught at slip – one of three victims for debutant teenage pace bowler Ed Barnard. Lees also added 61 for the second wicket with Maxwell before falling in the 24th over when he was stumped off the spinner Saeed Ajmal, ending an innings full of murderous drives and meaty clips. On a pitch offering good pace and carry, Maxwell soon had his eye in, and he showed it by lofting Ajmal for six over long-off. Another maximum followed when he launched the leg-spin of Brett D’Oliveira over mid-wicket, Maxwell going to his half-century from 46 balls. It took him only another 25 deliveries to bring up his hundred, which included further sixes when D’Oliveira was dispatched over square-leg and Ajmal deposited over long-on. Maxwell looked set for a massive score, but he was one of three wickets to fall in 11 balls as Yorkshire were pegged back a touch to 236-5 in the 39th over. 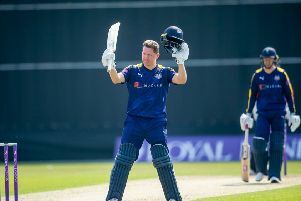 The first of those wickets was that of Gary Ballance, whose quest for a third successive Royal London Cup half-century ended on 28 when he skied Charlie Morris to Ajmal at mid-on, ending a stand of 105 with Maxwell in 14 overs. Maxwell was caught behind trying to scoop Barnard in a kind of left-handed leg-glance, and then Barnard had Will Rhodes caught behind for a golden duck. The trio of wickets hardly halted Yorkshire’s momentum, Jack Leaning and Adil Rashid combining in a stand of 102 from just 65 balls. Rashid was caught behind for 41 off Morris in the last over, Leaning finishing unbeaten on 58 from 39 deliveries with five fours and two sixes. With Tim Bresnan out with a chest infection and Matthew Fisher dropped, Yorkshire went with a new-ball attack of Jack Brooks and Steve Patterson. Both were parsimonious and, in Patterson’s case, penetrative, Patterson running out Richard Oliver off his own bowling and then having Tom Fell caught at mid-on by Karl Carver. Daryl Mitchell was run-out by a throw from mid-wicket by Lees, Worcestershire slipping to 95-4 when Tom Kohler-Cadmore was brilliantly held by Rhodes running back at long-on off Rashid. D’Oliveira hit 42 from 56 balls before going caught behind off Plunkett, who had Ben Cox held by Rashid in the mid-wicket region. Ross Whiteley, the Sheffield-born player who struck 91 not out against Yorkshire in the T20 Blast, and then 101 against them in the Championship, top-scored with a List A career-best 77 from 51 balls with six fours and five sixes. Patterson returned to take the last four wickets in a 15-ball burst from the New Road end. Joe Leach was caught at deep mid-wicket by Ballance, Barnard pinned lbw, Ajmal caught at mid-on by Rhodes and Whiteley pouched at deep mid-wicket by Leaning to cap a ruthless team display.